"Walk" is a 28 minute long video, which should be looped. It depicts the Orange Order at their annual parade in Portadown, Co. Armagh, Northern Ireland. The Orangemen say that they do not march - they walk, accompanied by various marching bands playing flutes, fifes, accordions, bagpipes, drums, and brass and silver instruments. The stereo soundtrack of their music has been distorted. The participants walk into themselves, eventually disappearing, leaving only an empty road. 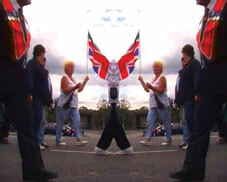 The Orange Order is a Protestant organisation based predominantly in Northern Ireland. It was founded near Portadown, County Armagh, Northern Ireland in 1795. To its members and supporters the Orange Order celebrates Protestant culture and identity, but its critics accuse it of sectarianism and anti-Catholicism. These parades take part throughout the summer "marching season", climaxing on the 12th of July. They celebrate the victory of the Protestant King William of Orange (William III) over the Catholic King James II at the Battle of the Boyne in 1690. Each year in Portadown the demonstration causes friction as they attempt to pass through the Catholic Garvaghy Road on their way to church in Drumcree, and often ends in violence with the police and British army intervening to keep order. Victor Sloan was born in Dungannon in Northern Ireland and graduated from Belfast and Leeds art schools. He is an influential artist. Fellow of the Royal Art Society, of the Royal Photography Society, of the Order of the British Empire since 2002 and academician of the Royal Ulster Academy, Victor Sloan won many awards, including the Academy's Conor prize in 1998 and the Gold Medal in 1995. Victor Sloan is an "educator", he is interested in the different political, social and cultural aspects of Northern Ireland and of its conflict. His works are powerful, inventive and versatile. They can be seen in numerous private and public collections. A major photographer and videast, Victor Sloan exhibited intensively across Europe, North America, South America and Asia, thus gaining an international reputation. In 2001, the Ormeau Bath gallery in Belfast dedicated a major retrospective exhibition to him.